Guess who finally watched all 13 episodes? Anyone who knows about writing fiction knows that throwing a character into an unfamiliar situation makes for a great story. It creates a lot of tension and potential for conflict. Almost clichéd, many short stories center on a young person moving to, or visiting, a new place. Kimmy (played by Bridesmaids Ellie Kemper) can very much be considered child-like, sheltered, and even a bit naïve. The premise is quite hilarious: a cult leader lures four women (called the Mole Women) underground in preparation for an apocalypse, which never actually happens. After authorities save them, Kimmy chooses to live in New York City and start her life over. She finds an apartment, but she must also find a job in order to stay there. Her first attempt at a candy shop leads to her second attempt with Mrs. Voorhees. On her first day as a nanny, Kimmy shows up two hours late. Voorhees fires her, and she goes to her roommate for advice. He encourages Kimmy to go back to Indiana because it’s so hard to make it in the city. While waiting for her bus, a memory from the bunker inspires her to push through. 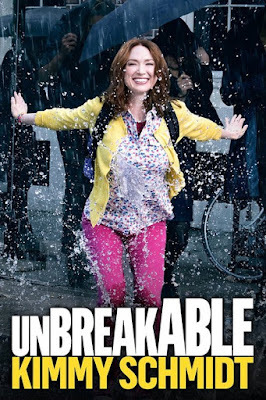 Most people aren’t lazy enough not to have seen the first, short season of Unbreakable Kimmy Schmidt. But if you haven’t, the spoilers start now. It’s nice to see a lead character with such a flaw. Her nature provides great material for the show, but also proves to be quite the asset at times. Fans love her for her gleeful optimism, where elsewhere it might be portrayed in a purely negative way. Kimmy’s roommate, Titus Andromedon (formerly Ronald Wilkerson), a struggling singer who also happens to be black, gay, and poor, tries to help her realize the crap-shot NYC can be in the first episode, but she relents. After the bus incident, Kimmy finds Titus in Times Square and convinces him that they both need to fight for their dreams. Meanwhile, Kimmy’s employer struggles with insecurities in her marriage. Her husband travels for work all the time, and she feels she has to make an extraordinary effort to garner his attention when he is home. Jacqueline Voorhees eventually finds out he is cheating with their marriage counselor. Kimmy’s optimism and sense of right and wrong help convince Jacqueline that she can and should move on and be happy without him. Titus steals almost every scene he’s in, and it’s hard not to love his huge personality. He may be somewhat of a gay stereotype, but it’s forgivable. His heart is in the right place, and he is much more than the gay best friend trope. Early in the season, he and their landlord stick up to Zan Voorhees for Kimmy, hardly even knowing her. Throughout the first season, Titus and Kimmy balance each other out, and make a perfect team. Kimmy’s positivity counteracts his bitter realism and vice-versa. They both grow quite a bit from their relationship, without compromising their distinct personalities. Titus delivers quite a few hilarious lines, too. Two favorites occur as he shows support and helps Kimmy. Mrs. Voorhees arranges a dinner party for her husband’s return, and Kimmy needs to dress up. In this same episode, their interactions and Kimmy’s will convince her that she needs to testify on behalf of all the Mole Women. Ultimately, she presents the evidence (a video tape dated close to the date of the “apocalypse”) that locks up the reverend. 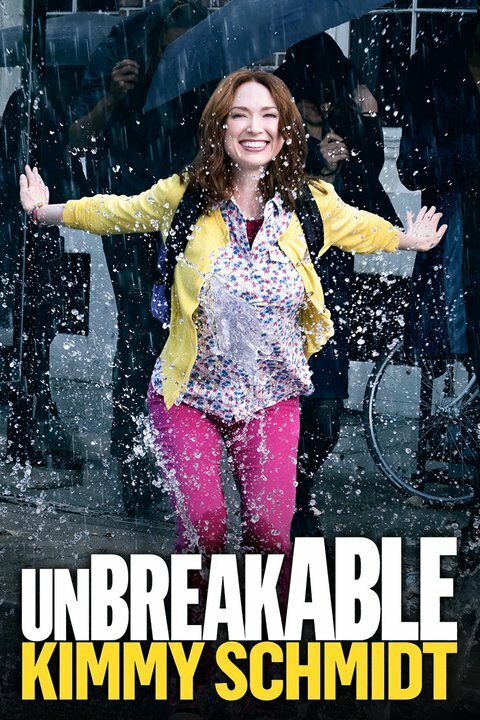 Like the title suggests, Kimmy Schmidt displays incredible resilience and strength. Would you really expect any less from Tina Fey? Here’s to an equally impressive second season.